It might have been a preview night, but the Company of Canada Rocks! The Hits Musical Revue 2014 show delivered a performance that rocked the rafters of the newly-reopened Homburg Theatre in the Confederation Centre of the Arts. A 26-member cast, 14-member orchestra, and 4-man rock band regaled a full house with 74 songs spanning several decades of Canadian hits from the 60s all the way to Paper Lions, PEI’s rock band-winner of the 2014 Independent Music Award for Best EP – Pop (Pop/Adult Contemporary;See more at: http://awardsandwinners.com/ceremonies/12th-independent-music-awards/#sthash.Tvoi3GMH.dpuf). Musical Director and Arranger Craig Fair led the orchestra and band in an almost non-stop score with only the intermission as a break, showing off not only great musical panache but the excellent new sound system as well. Renée Brode’s lighting design, sometimes intense and emotional, most of the time playful and spectacular, likewise exploited the extensive capabilities of the new lighting system—something I would want to play with myself. I only wish that the two spotlights set in the back of the stage were not so blinding when they were bare—a result of their being set so high on the raised stage they were pointing directly at the audience at the start. The production design by Charlotte Dean was enhanced by 23 screens, on which video images were projected—sometimes to create a single gigantic image, sometimes displaying 23 different images that were entertaining on their own; kudos to projection designer James Nesbitt. The show was directed and choreographed by none other than long-time Charlottetown Festival Artistic Director Anne Allan, who, along with Doug Gallant, Terry Hatty, Wade Lynch, and Hank Stinson, wrote and conceived the whole musical revue, which took the audience on an East-bound journey from BC to PEI. Overheard from the audience was a desire to see a more consistent story line, with the train-trip theme more evident. That might have made the performance more theatrical than revue-ish, but it could not matter less to me. In fact, I had to look away from certain video footage because they induced a touch of motion sickness. Nonetheless, the projections enhanced the story of Canada’s music industry, creating a more synaesthetic and memorable experience in a way that the songs and narration alone cannot. While I enjoy a wide variety of musical genres and avoid really loud music and wild concerts, I have to say that the loudness of the sound system was within tolerable levels and not deafening—something I really appreciated. 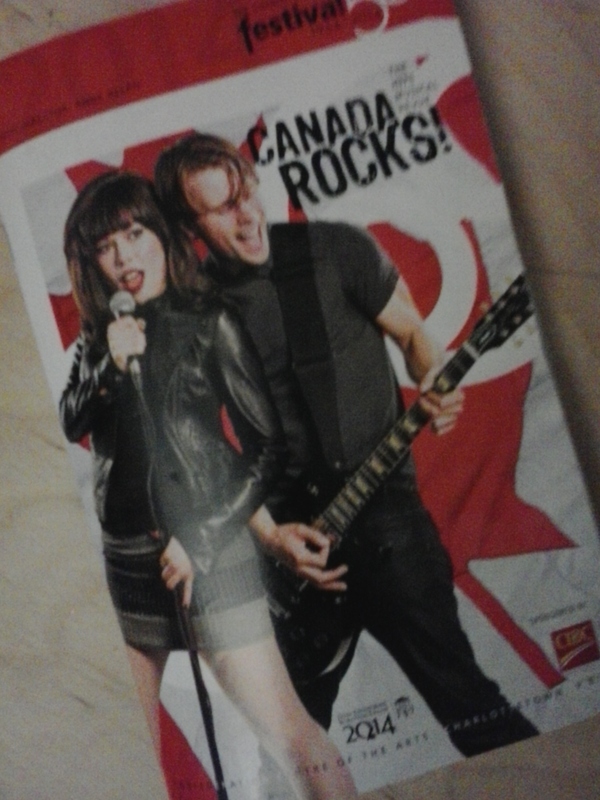 Much more than that, however, is the way Canada Rocks! The Hits Musical Revue is my first real lesson in Canadian music. Not having been born here, I was quite unaware of the who’s who of Canadian music, thinking all the music I heard growing up on the late Casey Kasem’s American Top 40 was American—such was our exposure to the Western world. I was pleasantly surprised to discover, in the few years I have lived on this Island but mostly through this Musical Revue, that so many songs I was familiar with and learned to love are actually Canadian; and so many musicians I liked—both singers and songwriters alike—are Canadian. This knowledge made the show not only enjoyable and educational—it made the show more personal: Canada Rocks! made me feel that I have truly come home.